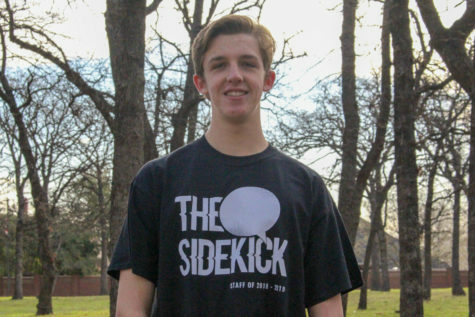 As senior kicker Caden Davis set up a 51-yard field goal with the clock winding down – a sight all too familiar for Coppell – players knelt, prayed and hoped for a kick through the uprights. The kick went up and in with 37 seconds left and the Coppell players, fans and coaches exploded in excitement. The Cowboys walked off the field with a 24-23 win over Marcus at Buddy Echols Field. 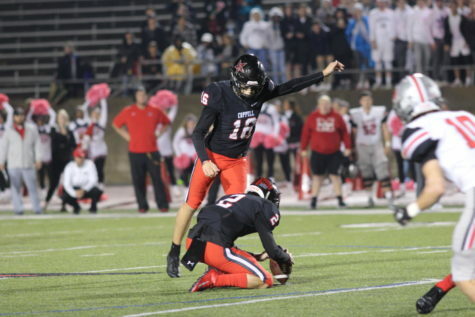 Coppell High School senior Caden Davis kicks a field goal from the 34-yard line with 37 seconds left during the game last night at Buddy Echols Field. The Coppell Cowboys defeated Flower Mound Marcus 24-23. Leading up to Davis’s field goal was a series of plays by the Cowboys that set up their star kicker for the winning kick. The beginning of which was a 90-yard kickoff return by senior Dantrell Moss with seven minutes remaining. Senior wide receiver Josh Bartolacci scored soon after on a 10-yard pass from junior quarterback Drew Cerniglia. This brought the score to 23-21, Marcus. After getting the ball back on a turnover on downs, Cerniglia threw a crucial third-and-eight completion to senior wide receiver Jonathan McGill for the first down. Three plays later, Davis was setting up for the kick. Prior to the fourth quarter, however, Marcus (4-3 overall, 2-2 in District 6-6A) kept the lead for the majority of the game with senior running back Justin Dinka in the lead role. Dinka, a former Coppell player, scored multiple times and was a constant threat on the outside run. The Marauders started the game off with a touchdown early in the first. Coppell senior quarterback Rasheed Noel was able to tie it up in the second with a sneak from a few yards out to bring the score to 7-7 with less than 10 minutes left in the half. However, shortly after, Marcus took the lead again with a 74-yard touchdown pass as the receiver slipped out of the grasp of several pursuers: 14-7, Marauders. Marcus later extended its lead in the third with a 20-yard completion, followed by a touchdown up the middle on the next play. However, for the third week in a row, Coppell blocked the PAT, keeping the score at 20-7; this blocked extra point would become integral to the Cowboys win. After only scoring seven points throughout the game, the Cowboys stepped it up in the fourth quarter, scoring 17 points in 12 minutes. This was in part due to the dual-offensive threat that is seen with Cerniglia at quarterback and Noel at receiver. Earlier in the season, Noel was put at quarterback, which left senior running back Ryan Hirt as the go-to guy when it came to offense. This made it easier for teams to predict the coming play. But with Noel at receiver, the team now has two threats – one at running back and one at receiver. This helped spread out the defense and gain Coppell yards – and points. The development of Cerniglia as a starting quarterback will be an important part in Coppell’s playoff run. At the beginning of the fourth, Cerniglia put Coppell back in the game with a 35-yard touchdown pass to McGill, making the score 20-14. Then, with Bartolacci’s touchdown and Davis’ field goal, the Cowboys came out on top. Coppell will play again this Friday at Joy & Ralph Ellis Stadium against Irving.